Professors are often hired for their research credentials, and are trained more for their research skills and abilities than for teaching skills. The University that hires profs hopes they can also teach, and often things work out very well, in part because Academics are able to take workshops on pedagogy, learn from mentors, and develop their teaching skills ‘on the job’. What might be useful, however, is for new Profs to hear some advice from people currently in the system, and learn from their mistakes. 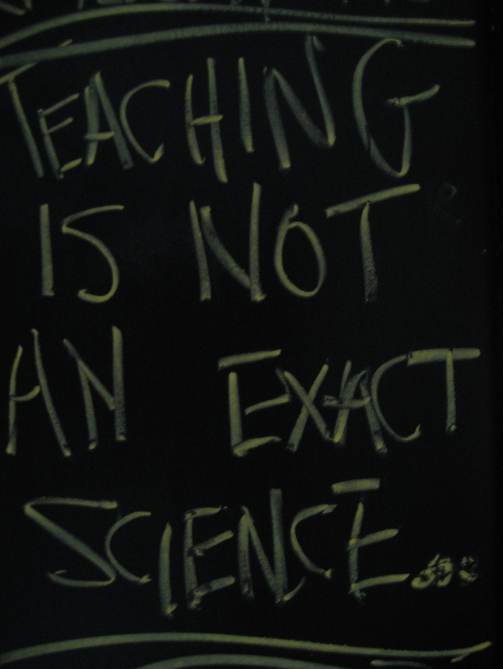 In this post, I will explore some ideas and thoughts about teaching, with a focus on things that would have been useful early on in my teaching career (note: these words of advice come from my own perspective in teaching science classes, sometimes in a ‘podium-style’ manner). 1. Be confident, even though you’ll always be nervous: Standing up in front of an audience is always nerve-wracking, and even though it gets better with time, the butterflies and anxiety will likely remain. Despite over 11 years of teaching, and despite often teaching the same courses year after year, I always get nervous. This means you have to develop a strategy for handling your nerves, and recognize that they make you a better teacher. Not being nervous might suggest overconfidence, or lack of interest, or might suggest you are becoming a little too familiar with the material (time to change it up?). Being nervous is normal and will raise the level of your game and keep you on your toes. Strategies for nerves are rather specific to the individual, but I try to make sure I’ve had a good breakfast (or lunch), that I know the material (being prepared is key for helping with nerves), and I try to keep myself occupied in the hours leading up to lecture. I also try not to show up too early for lecture, so that I stand and fiddle around in front of the class worrying away until the clock slowly ticks towards the start of lecture. Regardless of your nerves, however, instructors must exhibit self-confidence! Students need to know that you are confident and in charge of the course and its material. The challenge is to have this sense of confidence despite having jitters… but you must find a solution; without confidence, you’ll lose the room and nerves can rattle this confidence. 2. Don’t over-prepare: teaching will take all the time you give it. If you start preparing lectures in early August for a course that starts in early September, you can potentially spend all your time on preparing material, yet still find yourself scrambling to re-think and re-work material once the course actually starts. It’s key that you prepare your course outline and learning outcomes early, develop an assessment strategy, and develop a plan in broad brushstrokes, but be cautious about getting all your lecture material ready too much in advance of the course starting. From experience, when I prepare early I just end up re-doing the work anyway. This advice, however, does vary depending on your knowledge base related to what you are teaching. If you are thrown into a new course that is beyond your area of expertise, it is important to do a lot of background reading well in advance. 3. Be honest: If you don’t have a good answer to a student’s question, don’t try to stumble through an answer. Just say “I don’t know – let me get back to you”. Then, after lecture, figure out the answer and return with that answer for the next lecture. University students are smart, capable, and can spot it when an instructor is faking it. When that happens, your credibility sinks, and you end up making a big mess of things. However, being honest about not knowing the answer shows you are human, and coming back with a solid answer shows that you care. Similarly, be honest when you screwed up something during lecture. Almost every year that I have taught, I have ‘repeated’ a lecture because the first time I tried, it was a mess. When that happens, start again next lecture. Sometimes you can also ‘restart’ a lecture part-way through if things are not going well. 4. Innovate: Boredom when lecturing is significant problem. Always change how you teach, what you teach, and how you assess students. Don’t be afraid to mix things up now and then, as this will keep thing fresh and exciting for both you and the students. When your University’s teaching services unit offers new and innovative ideas or workshops about teaching and teaching innovation, take advantage of these opportunities to learn about new ways to approach teaching and pedagogy. Try new technologies as they become available, from clickers to smart boards; you might end up adopting some of these, or you might go back to basics. Never settle for doing the ‘same old thing’ with your course. 5. Learn from mentors: As you establish yourself in a Department or Faculty, get to know who the best teachers are, and go sit in their classrooms. Go to a few lectures to see different styles of lecturing, and different approaches to content deliver. See the tricks and strategies for how instructors develop a rapport with students; how they use humour (or not), and assess their use (or misuse) of technology in the classroom. Assess what works, and adapt your own teaching to mimic those things. It’s also important to invite your mentors to come sit in on your own lectures. They can provide useful feedback for you, and (eventually) be in a strong position to provide you a letter of support in reference to your own teaching portfolios. In a University, many terrific teachers surround you, and you can and should use their expertise to improve your own teaching. 6. Slow down: A fatal flaw in teaching is that we often try to cover too much material. Almost all ‘seasoned’ Professors that I know have, over time, reduced the amount of material that they cover over a term. Take your time, cover concepts carefully, use examples, analogies, and keep the pace slow, especially if you want to have some level of student engagement. 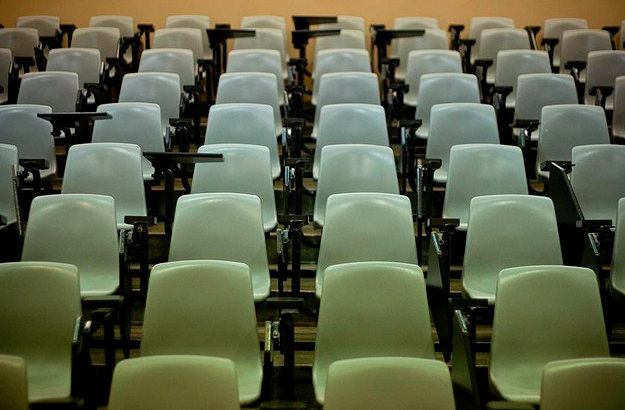 If you hurry all the time, students will be scrambling to keep up, become annoyed, and may stop coming to lecture. Pause every now and then, ask questions, respond to questions, repeat complex concepts, revisit past lecture material every now and then. I often tell relevant stories to force myself to ease into or out of material – for example, when I teach general ecology, I’ll often pick up a relevant blog post or news story and spend some time talking about that, and linking a ‘real world’ example to the course content. This is ‘value added’ material, and in addition to forcing me to cover less content and slow down, it also provides an opportunity to expand the course content. 7. Learn names: developing a rapport with students is important, and knowing names is key to developing this rapport. This is only possible with a bit of hard work at the start of each term, and then, over time it gets easier. Study your class list, put faces to names, and when giving back assignments, do it individually, looking at each student, saying their name out loud to them, and making that connection. I find it is possible to train yourself to learn somewhere between 60-70 names over about a 2-3 week period. This process allows you to make a connection with students, and you can call them by name for in-class activities, or address them in person when they are asking a question. Not an exact science.. Creative commons photo, from here. 8. Get help when you need it: not everything will go smoothly, and you’ll probably need to find some help at one time or another. As mentioned above, take advantage of pedagogical workshops or other events or conferences. If you struggle with presentation skills, either projection or pace, think about getting additional help: enroll in a night-course in theatre school, or subject yourself to the ridiculous but useful process of practicing in front of a mirror – this will help you learn your mannerisms and quirks, and help you develop presentation skills. Talk to the Chair of your Department when things aren’t going well, and s/he should be able to provide you with resources or other forms of help. It’s critically important to identify weaknesses in your teaching early on, and finding solutions to these problems. Although the temptation may be to focus on your research program, you can’t let your teaching suffer. 9. Pay attention to student evaluations, but don’t obsess over them: regardless of opinions on student assessments, they are a part of the process, and you will be evaluated as an instructor. The hard numbers often inform tenure and promotion decisions, and you must pay attention to these numbers. However, teaching is not a numbers game, and low evaluations scores do not necessarily mean you are a bad teacher. Maybe people sometime see a drop in teaching scores when new technologies or approaches are adopted. In other words, in may take a few years to see positive effects of new approaches to teaching and short-term evaluations may suffer. Try to look at these evaluations with a long-view, recognizing that there are many reasons for year-to-year variations in numeric evaluations, from ‘cohort’ effects, having a new baby in your home, illness, changing assessment types, etc. That being said, it’s important to read and act on written comments provided by students, or interpret them based on trends, especially over time. I have found that anyone who takes time to write down feedback often has insightful and useful things to say. 10. Have fun: Teaching is truly one of the most rewarding parts of the job: it’s exciting, ever-changing, and we mustn’t forget it’s an honour and a privilege to teach at a University. Take it seriously, work hard, but also have a little fun now and then. Remember, sharing and exchanging knowledge is an amazing process, and we ought to enjoy this process, interact positively with our students, and be able to laugh at our own mistakes, and at funny situations within the lecture hall. Strive to be firm, but approachable; confident but not arrogant; fun, but not goofy. In sum, I hope these tips prove helpful! Please comment, below, if you have other advice to offer. Let’s keep this conversation going. Great advice Chris! The university values teaching to the extent it can since revenues are fixed by students and by the government. Research dollars are not yet completely controlled so this is why I think they encourage this to a much greater extent. Teaching, for its importance, is undervalued by those being taught and by those responsible for its funding. It is no surprise that we start to undervalue it as well. Thanks for the comment! One great thing is that in many cases excellent researchers are also very often very good teachers. However, I agree that we must strive to value teaching, and work to ensure it’s not undervalued. Advice I received early in my teaching career and that has served me well over the years is that teaching and learning is a partnership endeavour. The teacher has the responsibility to teach and the student has the responsibility to learn. If I’ve worked hard to prepare a class and it doesn’t go well, it could be that I didn’t do a very good job, but it could also be that students didn’t do their part to make learning happen. Reminding myself of students’ role in their own learning helped me get through some challenging teaching times when I was learning to teach. Thanks for the comment, Carolyn! Excellent point: it is a partnership and there is responsibility to learn from all parties, and that learning also needs to expand beyond the actual ‘contact hours’. I think this is a great summary that captures a lot of the things I’ve learned this term, as I’ve tackled my first lectureship. “Be honest” is really important. My students are a smart bunch, and they challenge me every single lecture with thoughtful questions that indicate critical thinking (yay!). I don’t always know the answer, and I’m quick to say so. I’ve found that these situations can be good opportunities for students to share their own ideas/experiences – by throwing the question back to the class, we’ve enjoyed some stimulating discussions and arrived at many good solutions! I also say honesty is important from the perspective of having just re-done a fairly important part of a lecture that I goofed last week. The students were receptive and understanding and once the problem was addressed we were able to move on with no difficulty. “Slow down” is one of the best and simultaneously most challenging approaches I’ve adopted this term. My instruction method (primarily white board notes) naturally sets a slower pace, and I spend a lot of time doing group activities and class discussions that also “cut” into normal lecture time. Sometimes I don’t cover quite as much material as I’d hoped (this is the challenge) BUT I’m confident that the QUALITY of the learning is far, far greater than if I skipped the components where students are actively engaged with the material. Some of our most productive classes are those where we cover the fewest new concepts! About “over-prepping”: near the end of the fall term I spent a fair bit of time trying to “get ahead” on the first few weeks’ worth of lectures – and then found myself completely redoing them just before getting in the classroom. These days I prep one or two (max) days in advance, and don’t spend nearly the same amount of time per lecture that I did at the start of the term. That evolved over time, though – most likely with increasing confidence in my ability to remember the material, effectively facilitate in-class activities/discussions on the fly, and tackle challenging questions. I think it’s normal for newer teachers (and those doing courses for the first time) to spend more time, on average (and this extra time may be exactly what’s needed to help build that initial confidence!). Last, regarding confidence, while it’s important to convey an air of confidence in the classroom, I think it’s important to accomplish this without adopting a false persona. When I’m relaxed and being my normal dorky and excited-about-science self, I have fun and my confidence naturally shines through – trying to be something you’re not could create a real barrier between the instructor and students (like you said, students can pick up on a fake right away) and add an extra layer of unproductive mental/emotional preparation for the instructor. Thanks Crystal – I’m really pleased that the tips resonated with you – and your comments are really appreciated. I’m especially delighted at your last point about confidence – it’s a tricky balance but you are so correct in pointing out that a ‘false confidence’ can be problematic – and that enthusiasm and passion can bring out confidence in important ways. Thanks Elena! I too have used that technique -and it works really well! The folders are so useful, and provide a tangible connection to each student (one that otherwise might not occur). Great article with useful info, it will definitely going to help many professors to get some knowledge from your blog post.